WASHINGTON—As part of an effort to fix the nation’s ineffective budget process and prevent government shutdowns, three Republican senators introduced a bill last week that would prohibit lawmakers from leaving Washington if they fail to pass a budget on time. Sens. 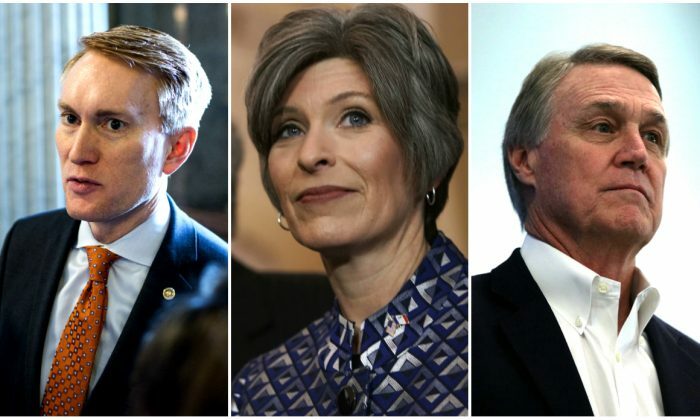 Joni Ernst (R-Iowa), James Lankford (R-Okla.), and David Perdue (R-Ga.) introduced on Jan. 17 the “No Budget, No Recess Act” to help responsibly fund the federal government on time. The legislation encourages lawmakers to approve a budget resolution by the deadline of April 15 and all the appropriations bills by Aug. 1. “Enough is enough,” Perdue said. “Washington’s broken funding process has created a dysfunctional cycle of continuing resolutions, last-minute spending deals, and government shutdowns,” he said in a statement. The bill proposes three changes to the current system. It prevents lawmakers from expending funds for official travel if they fail to meet the set deadlines for federal funding. Lankford complained that the existing system isn’t putting pressure on the Congress to take action on funding. He also criticized the fact that members are going home for the weekend, with some of them even flying out of the country. The bill also incentivizes lawmakers to stay in Washington by proposing two quorum calls to be held each day in both houses: one at noon and one at 6 p.m. local time. Missing votes repeatedly would embarrass lawmakers and, hence, this rule forces them to stay in Washington, according to the Committee for a Responsible Federal Budget (CFRB), a non-partisan organization. In addition, the bill prohibits a recess for more than eight hours until lawmakers meet the deadline they had missed. This means that Congress would have to cancel August recess until work is completed. Congress is required to fund the federal government by Oct. 1, which is the first day of the new fiscal year. However, the historical record shows that Congress has rarely followed the steps and met the deadlines set by the 1974 Congressional Budget and Impoundment Control Act. Since 1976, Congress has funded the government on time only four times. The last time the government was funded on time was 1996. When Congress fails to complete all of the regular appropriations bills before the beginning of the new fiscal year, it has to rely on short-term funding extensions called continuing resolutions. Over the past four decades, Congress had to pass more than 180 continuing resolutions, according to the U.S. Senate Committee on the Budget. Especially since the beginning of 2018, the budget has become a tactical game for political parties, leading to delays, uncertainties, and three government shutdowns in a year. The current partial government shutdown that began on Dec. 22 has become the longest shutdown in U.S. history. It marks the 21st time the federal government has shuttered since 1976. The current shutdown has halted the operations at nine departments—about a quarter of the federal government. It stretched into its fourth week after congressional Democrats and President Donald Trump failed to reach an agreement over funding for a wall on the southern border. Democrats have turned down the Trump administration’s demand for $5.7 billion dollars in border-wall funding, which amounts to almost 0.1 percent of total federal spending. Nearly 380,000 federal employees are furloughed during the shutdown and 420,000 are working without pay. Before this year, the record for the longest shutdown was 21 days. It took place during fiscal year 1996, from December 16, 1995, to January 6, 1996, as a result of a budgetary impasse between the Republican-controlled Congress and Democratic President Bill Clinton. Fixing the budget process is also vital for solving the nation’s debt problem, according to Perdue. “You’re not going to solve the debt crisis by fixing the budget process alone, but you will not solve it unless and until you do start fixing the budget process,” he said at a panel discussion in February last year. The U.S. national debt stood at nearly $22 trillion at the end of 2018. National debt held by the public is 77 percent of the gross domestic product, according to the CFRB. This is twice the average of the last 50 years, of 40 percent. The U.S. national debt spiral began after the 2008 financial crisis, when the Obama administration and Congress approved a stimulus package in order to keep the economy afloat.